My Dogmeat ran off and managed to get killed. So far this has happened to two of the three followers I've also had. One decided to get into a one on one brawl against a Deathclaw. When I came across her corpse I just stared, raised an eyebrow, and shook my head. The AI is just plain ol' stupid. That said, even if the palettes are recycled, I'm constantly constructing my own stories. Such as the person in a bathtub, surrounded by empty liquor bottles. The damaged garden gnome in the bathroom of what appears to be an all male academy, with the faculty bathroom having all sorts of cherry bombs in and surrounding a destroyed toilet. There are all these stunning little details that constantly remind me that this was once a world that flourished, and I'm only seeing the devastated Reconstruction that has occurred. I want to post on this particular topic more, but have forced myself into a Fallout 3 embargo after posting about it twice already. Perhaps next month... Will give me time to breathe when I finally manage to complete it and then go on and have a bite-sized snack on another game before trying it again. For me -- and many other lifelong gamers -- this moment came in the opening minutes of Morrowind. Oblivion was technically bigger, but I think most people agree that Morrowind felt larger and more overwhelming. There was no compass arrow pointing you where to go, just an NPC saying "go to Balmora". Where was Balmora? Walk down the road and read signposts. I'm in a weird position - I absolutely adored Oblivion, and I was sure that it was all about the beautiful world Bethesda had constructed. And yet I can't help but find fault with the world that Bethesda have now created in Fallout 3. I'm beginning to feel like a prophet of doom so often it is that I now say "I just don't really like it". Maybe it's aesthetically not as attractive to me. 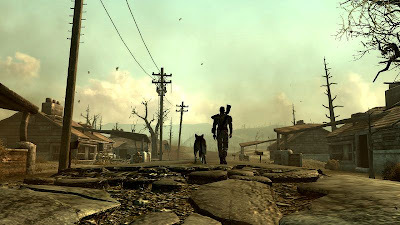 Maybe it's because even though, as you rightly point out, while a lot of love and attention to detail has gone into the Capital Wasteland, I can't help but find it jarring that after some 50 odd previous scavenging I can now come along, find and clean-out nearly every building and location in the world. It frustrates me, to say the least, and the eventual overabundance of "stuff" I accumulated before I finished (at lvl 20 of course) meant that F3 had none of the sense of 'lack' and 'struggling to survive' that the earlier games had. For what it's worth, by the end of Fallout 2, I had so much crap I didn't know what to do with it all, power armor for my whole team and fancy weapons enough to take down the Enclave. It got so bad, I spent a good chunk of the last quarter of the game struggling to find people with enough money or stimpacks to buy my crap off me. Every time I think I'm about to be disappointed by sameness in Fallout 3, Bethesda surprises me. Earlier today I was scouring the Arlington Library. I expected it to look a lot like the Museum of History or the National Archives. It turns out the place had been taken over by raiders and it was plainly obvious. Tortured, broken bodies, ammo and bottles of hooch cascaded throughout the library's halls, in contrast to the broken emptiness of the museums on the Mall. I have yet to be disappointed by the environs of the Capital Wasteland. The one bit of weirdness is I haven't come across a single follower (that liked me anyway) yet. Granted, I've spent most of my time in the DC Ruins where things are a lot less friendly. @denis: I had this same problem with my treasured dog running into firefights and getting himself killed; the companion AI is, if anything, less manageable than Fallout 2. You're right about the environmental storytelling though, I hope you'll write about it. @ben: As I mentioned back in my Survival Horror post, I liked the feeling of scarcity that I had in the early portions of the game. for the first few hours I found myself short on ammo, but by now (level 16) I have more ammo, caps, and stimpacks than I know what to do with. And I was frankly offended when I ran into a Super mutant early in the game and it failed to kill me. But as Julian points out, the previous Fallouts also had a definite point where you reached escape velocity. In both Fallout 1 and 2 I hit points where I no longer had to worry about ammo and health and the like. What I like, though, is that after reaching escape velocity in Fallout 3 I still feel this great incentive to go out and explore the world, just discover locations and kill raiders. Admittedly, your interest in keeping on will depend on how the world suits your tastes. @nelsormensch: I totally agree w/r/t the creativity of the environments. It's possible to get pretty far without getting followers (I ran into Dogmeat accidentally, early on), but i've heard there are some great characters out there later on in the game. Very good post on Fallout, and my feelings regarding it and Oblivion pretty much mirror yours. By the time I got to around 20 hours in Oblivion, I was pretty bored. Impressed with the world, but bored with the game. I'm about 15 hours into Fallout and loving it. They've also managed to create a sense of dread and depression, yet punctuated with bright flares of humanity (like Moira's cheerful research). That contrast really makes it feel like a post-apocalyptic world where the human race is trying so very hard to survive and rebuild.